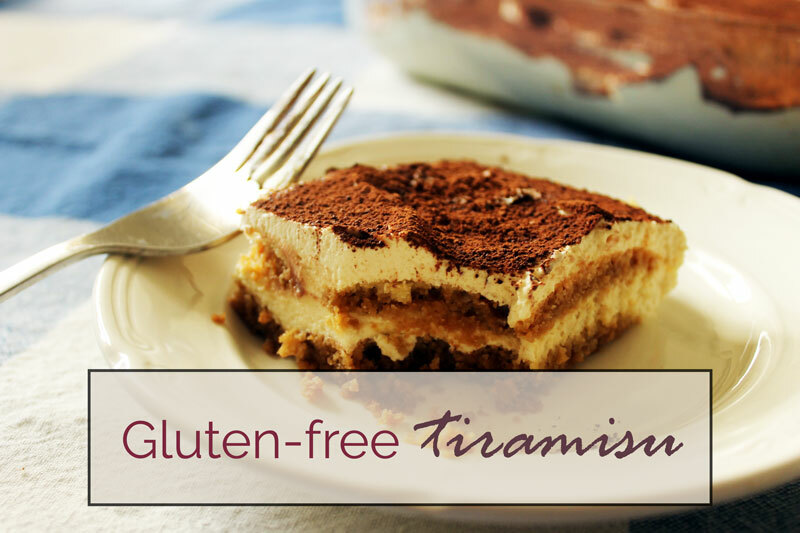 Tiramisu is a decadent, luxurious dessert that is simply not bothered by calorie counting, health kicks or concerns about your figure. Tiramisu does not care. All it wants to do is wrap you up in creamy, coffee and rum flavoured naughtiness ad give you a big dessert hug. Go on, let it. It’s a very rich dessert, which means it’s actually harder to eat too much. The only problem will be if you have leftovers and it peeks out from your fridge, calling you at breakfast, lunch and dinner time, begging to be eaten in place of more sensible meals. Tiramisu is made by layering sponge ladyfingers (savoiardi) that have been soaked in espresso and rum with a creamy custard and mascarpone layer. They do make gluten-free ladyfingers, so you can use them if you don’t fancy making them from scratch. They are not hard to make: simply pipe the batter into “fingers” on a baking tray. This recipe is one of ten I have contributed to the brand new eBook, “A Gluten-free Dinner Party“. Available for the web, iTunes and Kindle. The Culinary Quandaries series aims to make it easy to cater for different diets ad they have also recently released “A Vegan Dinner Party”. 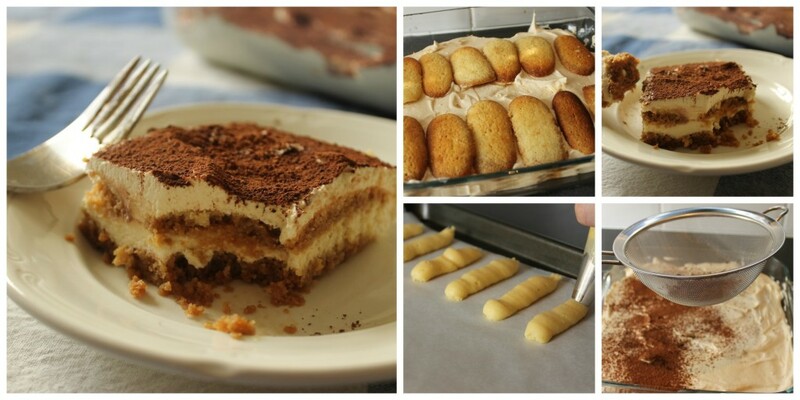 If you like this tiramisu recipe, please consider buying the eBook and supporting my work. The recipe assumes you will be making the ladyfingers from scratch. If buying ready made gluten-free ladyfingers, start reading the ingredients from the espresso. Beat the sugar and butter together. Add the eggs, one at a time. Mixing each time until well combined. Sift the flour, ground almonds and vanilla sugar together and combine with the mixture until you have a smooth batter. Transfer the mixture into a piping bag with a wide nozzle. Line a baking tray with baking paper. Pipe out “fingers” about 3 inches/10cm long until all the mixture is used up. 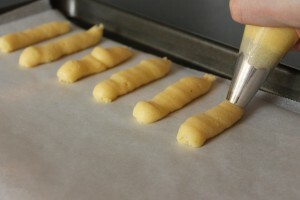 Be sure not to pipe the lady fingers too close together, as they will spread out when they are baked. Bake for 8-10 minutes until golden. Transfer to a wire rack and leave to cool completely. Beat egg yolks in a bowl over a double boiler until light and fluffy. Add the sugar and sweet wine and continue beating until the mixture thickens (about 5 minutes). This is called a zabaglione. Mash the mascarpone in a bowl until smooth. Add the zabaglione and mix well. In another bowl, whip the cream until very light. Fold this into the zabaglione mixture. In a small bowl, put the espresso and brandy/rum. Dip each ladyfinger into the liquid and place on the bottom of the serving dish. 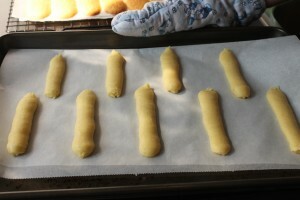 Once the bottom layer is covered, spread half of the zabaglione mixture on top of the ladyfingers. 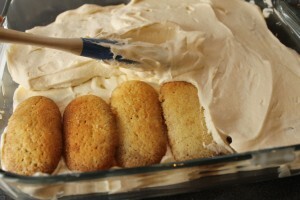 Start dipping and placing ladyfingers on top of this layer and finish it off with another layer of zabaglione mixture. Dust a little cocoa powder on top of the entire dessert. Cover the finished dessert with cling film and refrigerate for at least 4 hours or overnight. If you enjoyed this recipe, please consider buying the eBook and supporting my work! Oh my heavens that looks delicious!! I have only had gluten free tiramisu once and it was at this tiny restaurant in Trastavere in Rome. We found it on our last night there and were devestated we couldn’t go back for more. At least now there’s a recipe I can use to make my own. Will be great for a late summer pud when we have friends over! Thanks! This recipe has been approved by gluten-eaters so there you go 😉 I had to invite people over to eat it all because it was just sitting and staring at me in the fridge! Hi, HappyCoeliac, thanks for the amazing recipe! What is the sweet wine for, I can’t see it used anywhere? Hi Val – well spotted! The sweet wine should be put in with the sugar when making the zabaglione. Sorry about that! Generally, you soak the lady fingers in the wine. Hi, the sweet wine IS mentioned, in point 6. But regarding the recipe ingredients – just a small point, I do think it would be more helpful to list the ingredients in the order in which they’ll be used… …so, the sweet/Marsala wine next to the eggs and sugar? Also, I haven’t found g/f lady fingers so I just make my own sponge cake, cook it in a flat baking tray (one you use for brownies or swiss roll) and break that up to soak. or just lay it in the bowl, pour the espresso/brandy mixture over it. This is my coeliac daughter’s absolute favourite dessert… and normally she wouldn’t eat cream at all!! Hi! I love Tiramisu, and being Coeliac, I’ve had to learn to make my own, and swap ‘lady fingers’ for a gluten free version. After much thought, I decided to search through the gluten free aisle at the store and horah! I found a great substitute, some nice sponge biscuits. They work wonders if you don’t have the time to make the fingers yourself. Great recipe!! Thanks for sharing with us!! Hi! 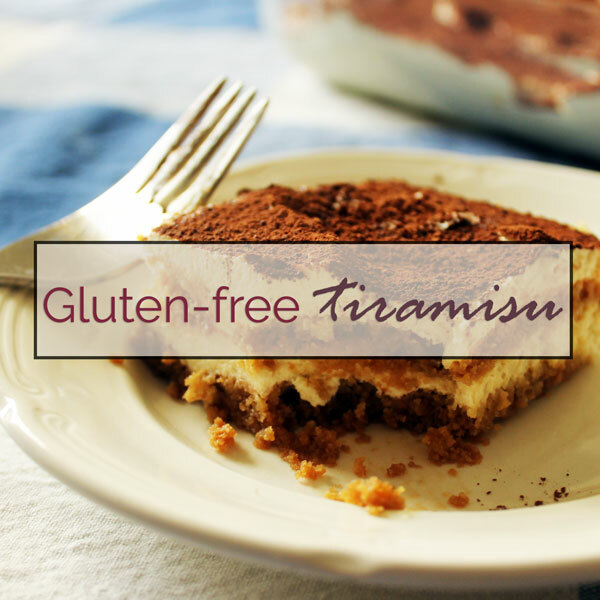 I love Tiramisu, and being Coeliac I’ve had to learn to make my own, and swap ‘lady fingers’ for a gluten free version. After much thought, I decided to search through the gluten free aisle at the store and horah! I found a great substitute, some nice sponge biscuits. They work wonders if you don’t have the time to make the fingers yourself. I plan to make this for a gluten free dinner party, and I’m not sure what “vanilla sugar” is. Can you help me out? Is mascarpone cheese typically GF? I just wanted to ask, Since I have made “lady fingers” before but not not gf 🙂 . why do you add the almond flour to the recipe and not just the gf flour? is it too make sure that the biscuits don’t become too dry? or would there be another ingredient that you could add instead of almond for someone that has a nut allergy? Hi Stella, the almond flour is really just a preference – I think you probably could just add the 50g of extra gf flour instead and if the consistency doesn’t seem right you can add a bit more or less liquid, but this probably won’t be necessary. Hope this helps! 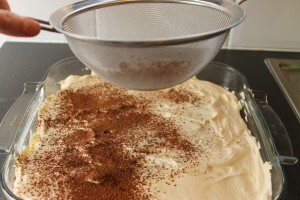 I´ve tried many tiramisu recipes. Yours is definetely the BEST. Thank you, that is so nice to hear! Greeting from the Netherlands! I was just wondering what size of dish you used?